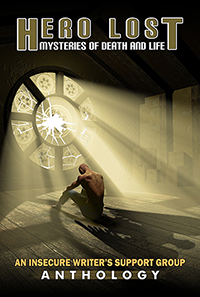 This week, I got in touch with Erika Beebe, my fellow author in our upcoming anthology, Hero Lost: Mysteries of Death and Life, to explore where her stories come from. I present to you, Erika, the author of The Wheat Witch. R: Tell us a bit about your writing, what do you usually write about? Where does your inspiration come from? E: Born and raised in Kansas, I somehow wound up in Missouri on the trails of a boy or two. I am a writer, graphic designer, aerobics extraordinaire, and of course a mom to a couple of two big-hearted kids. Mom is my first job of course, but the words in my stories never leave me alone. Ever since I was a kid stories seem to surface out of everywhere. Dreams, daydreams, at certain times I just sit and think with a pencil. In high school a fire drill went off and lined up outside, someone from class said to me,” You mean, you think up all this stuff on your own, without any sort of substance to help you?” My answer was yes. I didn’t need drugs then or anytime ever. It happens naturally, and I can’t stop it. For example, Recently, I had a freaky dream about Aliens inhabiting human bodies in search of an “essence” to cure their own degenerative disease, and boy, did I really want to get out of that dream. But now thinking about it, I could turn it into a pretty cool story. R: What made you take the first step to share your writing with an audience? E: I remember when my history writing teacher asked me to join my first writer’s group. Terrified, I wasn’t sure if I could ever share my thoughts with a circle of my peers. I made it through though, and the comments from my peers weren’t nearly as scary as I pictured them in my head. I think many writers are scared of an audience at first because we start to write for us, no one else. At least I did. It took my teacher to prod me though. She’s the one who made me believe my words were good enough for others to see. She encouraged me to become a teacher and write in the summers. Boy, I wished I would have listened to her. My writing career would have taken off so much sooner. R: What led to your decision to submit to the contest? E: I really liked the theme of this book. I think in life we all fall from grace from time to time. It’s the struggle to get up that’s so important to share with the world. I decided the contest was exactly what I needed to get out of my current writing funk, too. I didn’t believe I’d ever get published again and was losing my own internal steam. So I brainstormed the idea, thinking of my grandma and my dad, and excited again, I wrote with a fury for two long months. R: Have you had any prior experience being in an anthology? What did you like about it? What did you dislike about it? E: My first published story came from One More Day anthology with J. Taylor Publishing. I loved the theme then too. The audience was Young Adult, more up my alley, with a theme on time and what happens when it stops for a moment? How do you get it started again? I wrote “Stage Fright,” remembering my own fears in front of my freshman high school English class as I was reciting a piece of Romeo and Juliet. When I wrote “Stage Fright”, I had a hard time showing action instead of describing it. I think in general my sentence construction has improved too, and I can weave action in and out of paragraphs much easier. R: What are you most excited about being included in this anthology. E: Working with others. I love joint energy. R: What’s the one thing you want people to take away from your story? E: Human nature, heck, nature in general isn’t perfect no matter your skills and gifts. I hope others who read my story realize mistakes are unavoidable, but it’s what you do with the memory of those mistakes that count. My goal is to show others no matter what happens, you can always make the choice to do the good thing. You can also follow Erika on her blog, Facebook or Twitter. Hero Lost: Mysteries of Death and Life comes out May 2017. Take a look at interviews with other writers, including Ellen Jacobson, Oliver Shiny, Christine Rains and Aura Wilming. Got some thoughts on writing you’d like to share? I’d love to interview you! Give me a shout at renee@wiredcrow.com.